I am a natural gifted medium/clairvoyant. My gift has been inherited from my ancestors who were all gifted. 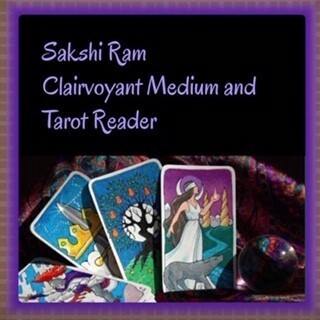 I use the tarot cards to help me and my spirit guides to connect naturally into my readings. I speak English, Hindi & Gujarati. I like to guide my readers to enable to visualize their future with a positive outcome. I'm dreamy: a typical piscean, and float away in a world of my own. Being the 12th sign in the zodiac, I am true to my sun sign. I use my intuition and look at the bigger picture. As a Pisces, I am very sensitive towards anyone I meet. I can easily draw into their emotional well being. Since I was young I have experienced premonitions and as I got older and had readings for myself, I kept getting told I had psychic abilities. I bought myself a set of tarot cards and had some training by a well known psychic reader & started reading for family & friends. I gave a friend's brother a reading who was quite distressed about his life after a long term relationship broke down - he had moved away and I predicted that he would move back home and would meet a lovely girl, get married and have 2 boys. The boys are now 7 and 10. My most memorable reading was where a lady had called me for a general reading. She mentioned nothing about losing her son. As I did the reading I got visions of a little boy playing football in a red t-shirt. She told me that was her son of 11 years old who had died about 6 months ago- he wanted me to let her know not to worry about him - he said get that new washing machine & told me to tell his mum that she was being lazy and she should pursue her career in hairdressing. I felt honoured that I was able to help this lady & her family. My natural ability to connect to spirit has sometimes surprised me & the people I have read for too many times. I feel it important that the person asking for the reading focus on the answers they are looking for (love, career, etc) and does not disclose too many details prior to the reading. Ur so amazing U picked up on my past n i only told u our names n birthdays Ur amazing i cant thank you enough for things ? U have relaxed me n guided me and j will do everything u ask of me. I will be back reading with you. I have found my Only #1 psychic i will ever read with You also made me laugh Thanks love Jody from windsor Ontario canada ? Had my first reading with sakshi! She is very down to earth and gets right to it! Gave a few predictions which matched up to previous readings! I would definitely connect with said hi again! Give this lovely lady a try you won't be disappointed! Will update with passing of predictions! Definitely adding to favorites! Thank you sakshi ??� ??? ??? Leave feedback for "Sakshi Ram".